Home » Votes for Women! We held a very special day on our last day of term, marking the centenary of women’s suffrage and votes for women. 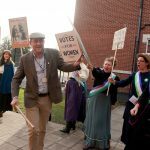 2018 marks 100 years since Parliament passed a law which allowed some women, and all men, to vote for the first time, and as an all-girls school it was pertinent that this occasion was marked in an appropriate fashion. We are one of 25 schools and academies belonging to the Girls’ Day School Trust (GDST) which has a rich history of involvement in the women’s movement. Notable alumnae include Emily Davison who attended Kensington High School (now Kensington Prep), remembered famously for throwing herself in front of the King’s Horse at Epsom. On Friday 16 February we held a whole day dedicated to the issues around women’s suffrage, incorporating this into the curriculum through themed lessons and discussions. Geography lessons focussed on women’s rights around the world; Religious Studies looked at the ordination of women priests; Maths lessons studied Bletchley Park and female codebreakers – there really was something to cover in every area of the curriculum. The Junior girls also took part in lots of activities including a brilliant rendition of ‘I will Survive’ and a huge ‘Zumbathon’ at the end of the day which parents came along to join too! Girls and staff came to school dressed in fashion from across the century, and there was also a special event in the school’s performing arts centre in coalition with the National Council of Young Women. 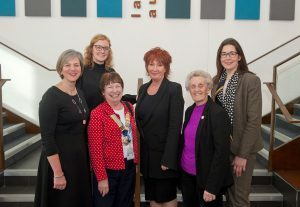 The event consisted of workshops on Women in Power, Women in Business and Overcoming Misogyny, and was attended by NCYW members from around the country, and some very influential guest speakers including Lillian Greenwood MP, Nora Senior CBE, and Apprentice star, Elizabeth McKenna. All of them were well received and had some positive words of advice for the girls, including to “recognise and use your power” as a woman in the world of politics; to have the confidence to not only smash through the glass ceiling, but the glass cage, in the world of business, and “be a radiator not a drain” of energy and positivity. The overall message from all three speakers was that girls should have confidence and faith in their strengths and abilities, and not be afraid to persevere in their pursuit of what they really want in the world. It was an incredible and educational day which girls, staff and guests enjoyed enormously. 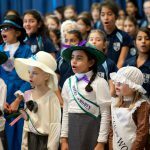 Bringing history and politics to life in this way was a valuable lesson for the girls, and brought home to them just how significant the suffragette movement had been.